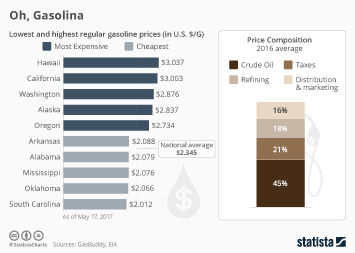 For a variety of reasons, including the fact that the cost of one gallon of gasoline equals the average daily income of a worker in some countries including Pakistan and India, gasoline prices are among the most publicly scrutinized prices of goods in most countries. In the United States, the retail price of gasoline is influenced by various factors, the most important ones being the price of crude oil and the local tax regime. The U.S. retail price of gasoline can be broken down as follows: 58 percent crude oil; 15 percent refining, 11 percent distribution and marketing, and 11 percent taxes as of July 2018. In most European countries, where taxation on gasoline is much higher, taxes can account for more than half of the retail price of gas. Although still well below the price in most countries, the U.S. price of gasoline has been rising steeply since 2002. In 2018, the average annual retail price for one gallon of regular gasoline was around 2.99 U.S. dollars, up from just 1.35 U.S. dollars in 2002. This price increase can largely be attributed to changes in the oil price, which saw the price of UK Brent crude rise from 25.01 U.S. dollars per barrel in 2002 to 71.99 U.S. dollars per barrel in 2018. In late 2014, however, the oil glut began, causing gasoline prices to decrease to a low of 1.89 U.S. dollars per gallon in the first quarter of 2016. The price of diesel has also been prone to fluctuation over the last decade, and clocked in at about 3.37 U.S. dollars per gallon as of October 2018.